Fillers and injectables such as botox and alternatives such as collagen fillers, radiesse injections, and hyaluronic acid, are treatments that can be very effective in reducing the signs of aging. Their popularity is definitely on the rise. These types of treatment provide more significant and immediate anti-wrinkle benefits than the use of most wrinkle creams. In addition, they are not very intrusive and have few major side effects. Many individuals consider fillers and injectables a nice alternative anti-aging treatment when compared to the more drastic procedures such as surgical facelifts. There are a variety of different filler and injectable treatments available. The most common one that many people have heard about is botox. 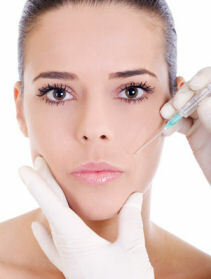 There are also alternatives, which are discussed in the injectable alternatives page. Botox (Botulinum toxin type A) is the toxin that is released from the bacteria that causes botulism food poisoning. However, while it can cause significant health problems as food poisoning, it cannot be contracted from cosmetic treatments. The purified version is injected in tiny amounts to the target facial muscle, blocking the nerve impulses and causing the muscles to become paralysed. As a result, when the individual squints or frowns there are no wrinkle lines that form. This treatment is used to treat frown lines, deep forehead wrinkles, crow’s feet, and general facial wrinkles. It can also be used for diminishing wrinkles on the chest, lessening the appearance of neck cords and to minimize some skin sagging in the facial area. Each treatment session can take from a few minutes to around 30 minutes, depending on the extent of the treatment. Results last for about 3 to 6 months. Side effects can include temporary headache and nausea, numbness and temporary weakness of neighbouring muscles, drooping of the upper eyelids, swelling, bruising and burning feeling at the injection point. This cosmetic injectable has also been used for temporary relief for ocular muscle spasms, problems with eye coordination, migraine headaches, and excessive perspiration of the armpits, feet and hands. Healthy Skin Portal is a leading resource for dermal fillers and injectables. Find out more about what BOTOX Cosmetic can do for you or schedule an appointment with a skin care clinic in your area.